I love cobbler. My mom made a paula deen blueberry cobbler with homemade strawberry ice cream the other night, and it was ridiculously delicious. I love it when you talk dirty! girl, the way to my heart are cobbler and crisps of any kind! The cobbler looks delicious! I'm adding it to my list of recipes to try. 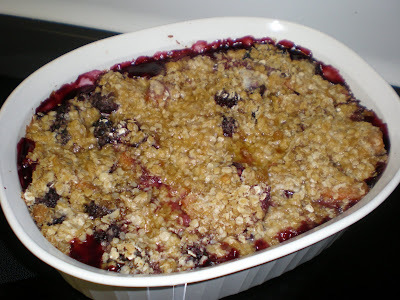 I love blackberry cobbler, especially if it is made with wild blackberries that grow where the snakes hang out. I don't want any ice cream on my cobbler, but I do like a teaspoon of butter melted on top. Thank you for sharing, you have the *best* recipes! YUM!!! That looks so delish and I love that it's easy to make! Yum! I just want to dig right in. I bet blackberry and peach go so well together! Cobbler is my favorite, cant wait to try this one! Thanks! Your recipes are always good!